U.S. 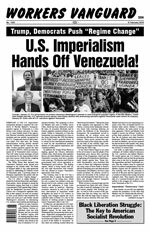 Imperialism Hands Off Venezuela! FEBRUARY 4—The U.S. imperialists’ transparent attempt to engineer the overthrow of Nicolás Maduro’s bourgeois-populist regime in Venezuela is a dire threat to the workers and poor. On January 23, Juan Guaidó, head of the opposition National Assembly, declared himself president and was quickly recognized by the U.S., Canada and a host of Latin American states. Five days later, the Trump administration, having already intoned that the “military option” remains on the table, leveled sanctions against the state oil company PDVSA, which accounts for nearly all of Venezuela’s hard currency. This will vastly worsen shortages of food and medicine for the impoverished urban and rural masses while further crippling the country’s one economic asset. The U.S. effort to topple Maduro is backed by both the Democratic and Republican parties, whose attempts to unseat the Venezuelan regime date back to a failed coup attempt in 2002 against Hugo Chávez. Like his handpicked successor Maduro, Chávez was a bonapartist capitalist ruler. But in that capacity, he used oil revenues to fund social reforms that benefited the urban and rural poor and further earned Washington’s animosity by denouncing U.S. military interventions and bucking its policies in Latin America. In particular, beginning with Chávez, Caracas established close ties with Havana and has provided its Stalinist regime with oil, helping keep the Cuban bureaucratically deformed workers state afloat in the face of relentless U.S. imperialist hostility. The campaign to drive out Maduro also aims to further starve Cuba, which has been subjected to nearly 60 years of economic blockade, and to foment capitalist counterrevolution on the island. Unlike in Venezuela, in Cuba the bourgeoisie was expropriated as a class in the years following the 1959 Revolution led by Fidel Castro’s guerrilla forces. It is crucial for the international proletariat to stand for the unconditional military defense of Cuba against imperialism and counterrevolution. In addition, the Trump White House is angling against the Chinese deformed workers state, which along with capitalist Russia, provided Maduro with loans after Venezuela’s economy went into a tailspin a few years ago. The Russian and Chinese governments both voiced opposition to Washington’s provocations. The Beijing regime, which is being repaid with oil, has also held discussions with Guaidó, who has offered to respect Venezuela’s agreements with China. The working class in the U.S. has a particular duty to oppose the imperialist machinations of its ruling class, which for over a century has slashed a long and bloody trail of wars, military coups, death squads and embargoes to keep Latin America under its jackboot. Opposing economic sanctions as well as any military intervention in Venezuela would strengthen the hand of U.S. workers in waging class struggle against the racist capitalist rulers at home. It is also in the interests of working people to demand: cancel Venezuela’s debt to the U.S.! As Marxists, our opposition to U.S. intervention in Venezuela does not imply the least political support to the bourgeois Maduro regime. At the same time as Washington has increased starvation sanctions, imperialist propagandists point to Venezuela’s hyperinflation, shortages of necessities and collapse of the oil industry as proof of the failure of “socialism.” In fact, there was nothing socialist about the “Bolivarian Revolution.” Taking the reins of the capitalist state apparatus in 1998, Chávez, a former army lieutenant-colonel, was faced with restoring faltering oil profits, the lifeblood of the Venezuelan bourgeoisie. He immediately moved to discipline the oil workers union and increase the efficiency of the state-owned industry. These moves earned him support from much of the ruling class, including the bulk of the military high command, which helped restore him to power following the 2002 coup. It was when Chávez began to use some of the oil revenue to ease the plight of the desperately poor masses that a growing section of the bourgeoisie, which got fat by siphoning off oil profits for themselves, really turned against him. Those lily-white bloodsuckers were horrified that a man of black and indigenous heritage was using some of those funds to finance reforms benefiting poor and dark-skinned Venezuelans. Nevertheless, far from a step toward socialism, the reforms served to defuse the discontent of the workers and poor and ideologically bind them to capitalist rule through Chávez’s bourgeois United Socialist Party. While oil prices remained high and the government was flush with cash, Chávez was able to fend off challenges to his rule and remain popular with working people—as well as with a section of the capitalist class that was doing very well for itself. But with the huge drop in international oil prices between 2014 and 2016, Maduro has faced an ever-deepening economic crisis. Now, as Guaidó and his U.S. backers stoke unrest, Maduro is relying on the military, the main power in the state apparatus. Chávez and Maduro both sought to secure top officers’ loyalty by giving them positions in food distribution, the oil industry and other lucrative businesses. While most of the brass has so far stuck by Maduro, one air force general has thrown down with Guaidó, who, along with his imperialist handlers, is calling on the military to switch sides. Last week, as right-wing mobilizations continued, oil workers rallied to denounce the U.S. sanctions and defend Maduro. We would oppose any U.S.-backed coup against Maduro and say that the proletariat must come to the fore in struggle against the imperialists and their Venezuelan cronies. But the workers must be organized based on political independence from the Maduro regime and all capitalist forces. The working class has the potential to lead all of the poor and the oppressed in a socialist revolution that sweeps away the capitalist state. That requires the leadership of a Leninist-Trotskyist party committed to the struggle for workers power from Venezuela to the U.S.
Juan Guaidó, we are told, has rightfully claimed the presidency on the basis that Maduro was not “democratically elected,” and power has therefore passed to the head of Venezuela’s National Assembly. In fact, the obscure 35-year-old was selected in December to head the Assembly by leaders of his right-wing Popular Will party. Groomed at George Washington University in Washington, D.C., Guaidó is a disciple of Leopoldo López, head of Popular Will. Currently under house arrest, López, who hails from the Venezuelan elite, graduated from the Harvard Kennedy School of Government, a CIA recruiting ground. Guaidó prepared his power bid by visiting Washington in December before swinging through neighboring Colombia and Brazil. Colombia’s “democracy” is headed by Iván Duque, one of a long line of right-wing rulers notorious for terrorizing and killing peasants and leftists. Brazil’s is led by Jair Bolsonaro, an admirer of the country’s 1964-85 military dictatorship. Helping direct anti-Maduro operations will be the old Cold Warrior, Elliott Abrams, recently appointed U.S. envoy to Venezuela. In the 1980s, Abrams was a linchpin of the Reagan administration’s anti-Communist dirty wars in Central America and its support for bloody juntas in Argentina and Chile. In 2002, he was a prime mover of the failed coup against Chávez. As the parties of U.S. imperialism, the Democrats and Republicans alike see every inch of land south of the U.S. border as their empire. Sanders might well think that sending in U.S. troops could backfire in Venezuela and spark turmoil throughout Latin America. The way that the Barack Obama administration did things was to impose starvation sanctions and channel funds to the opposition, an approach that Trump simply continued upon taking office. And it’s not as if the Democrats are averse to the “military option,” in Latin America or anywhere else (for example, John F. Kennedy’s 1961 Bay of Pigs invasion of Cuba; Lyndon Johnson’s 1965 invasion of the Dominican Republic; the 2009 Honduras coup supported by Obama; not to speak of the millions killed in the wars in Korea and Vietnam). Socialist Alternative (SAlt) and the International Socialist Organization (ISO), which posture as opponents of U.S. imperialism, were gung ho for the Sanders presidential campaign in 2016, with SAlt openly working inside it. These reformist outfits likewise cheered the election of Democratic Party Congresswoman Alexandria Ocasio-Cortez, a member of the Democratic Socialists of America (DSA). SAlt and the ISO serve as a fifth wheel to those like Sanders and the DSA, whose aim is to get the Democrats back in control of the imperialist machinery. We in the Spartacist League seek to break labor’s ties to the Democratic Party and to build a revolutionary workers party that links the struggle against U.S. depredations overseas with the fight against wage slavery and racial oppression in the imperialist heartland. In contrast to such opportunists, we told the truth about the bourgeois Chávez/Maduro regime from the beginning. In opposing the 2002 coup attempt, we pointed out that while Chávez had won mass support through his irreverence toward the rich and pride in his indigenous origins, “the role of populists like Chávez is to protect the capitalist order by deflecting the just rage of the oppressed masses” (“CIA Targets Chávez,” WV No. 787, 20 September 2002). It is a statement of Venezuela’s continued subordination to imperialism that it has exported most of its oil to the U.S. and depends on imports of food, medicine and manufactured goods. In countries of belated capitalist development, the bourgeoisie is too weak, too fearful of the proletariat and too dependent on the world market to break the chains of imperialist subjugation and resolve mass poverty and other burning social questions. Populist reform and neoliberal austerity are two faces of capitalist class rule in such countries, alternating from one to the other under shifting political conditions. Workers rule would place on the order of the day not only democratic tasks, such as agrarian revolution that gives land to impoverished Venezuelan peasants, but also such socialist tasks as collectivizing the economy. This would give a mighty impulse to the extension of socialist revolution internationally. Only the victory of the proletariat in the advanced capitalist world can ensure defense of the revolution against bourgeois reaction, eradicate poverty and open the road to a society of material abundance. This is the perspective of the International Communist League as we seek to reforge Trotsky’s Fourth International as the world party of socialist revolution. For Quality, Integrated Public Education! No to Charters! Defend the Gains of the Cuban Revolution! For Workers Revolution in Indonesia!